contemporaries, the gremlins, a lot of people aren't even aware that he only goes back to the early-to-middle 20th century. Rudolph began as an attempt to promote a chain of department stores. It was in 1939 that Montgomery Ward, which had been giving away coloring books every Christmas for years, decided to produce its promotional give-away in-house. 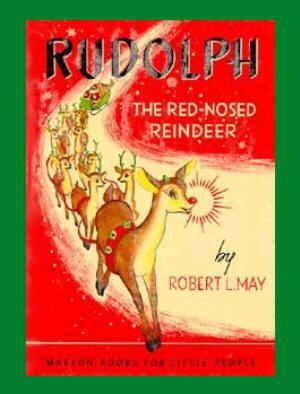 Robert L. May, who worked there as an advertising copywriter, was commissioned to write a story for young readers, and the result was Rudolph. May drew on some of his own childhood experiences as a puny kid that other kids sometimes picked on, to craft a story of a picked-on kid who made good, prospering as a result of the very attribute the others made fun of. Tho the story, written in the form of rhyming couplets, passed its first test with flying colors, Montgomery Ward's publicity department initially chose not to follow the judgment of May's 4-year-old daughter, to whom he'd read the story aloud as he wrote it. Red noses smacked of drunkenness, they said, which made them inappropriate for a sweet, gentle, parent-friendly Christmas story. But May enlisted illustrator Denver Gillen, a co-worker in the advertising department, to show just how parent-friendly Rudolph could be. With Gillen's artwork, they okayed it after all, and the department store chain gave away 2.4 million copies that year. Millions more were given away over the next several years. Rudolph hit the big screen in 1944. Max Fleischer, in a rare commercial credit following the closure of his studio, produced an animated version of the Rudolph story for The Jam Handy Organization (a Detroit studio that isn't as well known as the ones in Hollywood). That cartoon was shown endlessly on TV during the 1950s and early '60s. Unlike most Rudolph products, it's fallen out of copyright, and is now available on many inexpensive videotapes and DVDs of public domain Christmas shorts. In 1947, May negotiated ownership of the Rudolph property, which had hitherto been held solely by Montgomery Ward. It was shortly afterward that his brother-in-law, Johnny Marks, wrote Rudolph's famous song, first recorded by cowboy star Gene Autry in 1949. The recording not only sold two million copies that year — it went on to sell more than 150 million in the years since. In fact, the song is without a doubt the most familiar of Rudolph's media adaptations. Next came the comic book, which recounted Rudolph's subsequent adventures, after he'd become a part of Santa Claus's team. DC Comics published a new issue each December from 1950-62. Most were drawn by Rube Grossman (Peter Panda, Three Mouseketeers). The DC version was briefly revived in 1972 as a tabloid, written and drawn by Sheldon Mayer (Sugar & Spike, The Red Tornado). While the DC version was running, Little Golden Books produced its own version of the story, and followed it with Rudolph the Red-Nosed Reindeer Shines Again. Rankin/Bass Productions (Thundercats, Silverhawks) did the best-known animated version, the one narrated by Burl Ives as Sam the Snowman, which debuted on NBC December 6, 1964. Rather than traditional cel animation, they used a stop-motion technique with puppets, similar to George Pal's Puppetoons, but which they promoted under the trademarked name "Animagic". Rudolph's voice was done by Billie Mae Richards (Bobby in King Kong). Richards reprised her role in a couple of follow-ups, Rudolph's Shiny New Year (1976) and Rudolph & Frosty's Christmas in July (1979). Rudolph's first feature-length movie was titled, appropriately enough, Rudolph the Red-Nosed Reindeer: The Movie, and was released to video October 16, 1998. It boasted a multi-star cast, with voices by face actors such as Whoopi Goldberg, Bob Newhart and, as Santa himself, John Goodman. Rudolph was voice specialist Kathleen Barr (Dot Matrix in Reboot, various voices in Sonic the Hedgehog and Ranma ½). Barr played Rudolph again in Rudolph the Red-Nosed Reindeer & the Island of Misfit Toys, released to video October 30, 2001. All this, along with the toys, ornaments etc. that have appeared over the years, constitutes a clear indication that Rudolph did indeed, as that same song goes, "go down in history". Text ©2003-09 Donald D. Markstein. Art © Montgomery Ward.